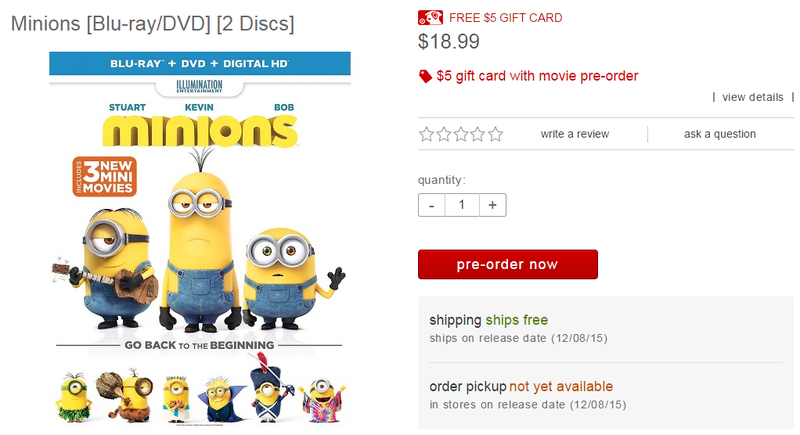 TopCashback offers $18.99 cash back for Minions Blu-ray DVD pre-order at Target.com. The item is currently priced at $18.99, and Target offers free shipping and free $5 Target gift card with this order. Please note that cashback deal is for new TopCashback member only. And, the item is pre-order. It will be released and shipped on December 8th, 2015. To receive $18.99 cash back, you have to make a transaction that contains ONLY ONE Minions Blu-ray DVD. If you buy multiple quantities or other items with the same transaction, cash back will be 1% or even 0%. Cashback offer is valid until 23:59 PT on Friday, November 20, 2015, or stock runs out. They also mention that you have to act fast because the price may change. If you have never used TopCashback and also want this DVD for free, create TopCashBack account and then click here.